Order Health Aid Calcium Complete 800mg from the Online Health Food Store UK. Buy Health Aid Calcium Complete 800mg - 120 tablets and other quality Minerals A - Z safely online in the UK. 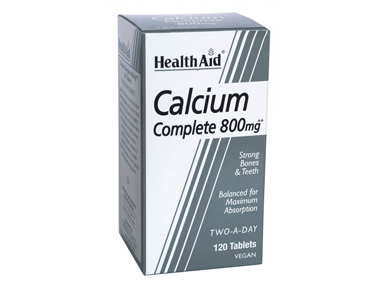 HealthAid Calcium Complete 800mg Tablets contain Calcium, which is one of the most important minerals in the body. It helps maintain strong bones and healthy teeth. HealthAid Calcium Complete 800mg Tablets contain Calcium, which is one of the most important minerals in the body. It helps maintain strong bones and healthy teeth. Also helps metabolise the body’s iron and other minerals. Calcium plays an important role in the control of the nervous system, heartbeat, muscle and other vital organs. HealthAid Calcium Complete 800mg Tablets from HealthAid are specially formulated with added vitamin D for optimum absorption. They contains Inulin, a Fructose Oligosaccharide (FOS) which helps maintain optimum gut health, offers a great taste and is tooth friendly. What Are Calcium 800mg Tablets For? Adults and children over 12 years of age, two tablets daily, preferably in the morning. Do not exceed recommended daily intake unless advised by a suitably qualified person. Calcium (calcium carbonate, calcium citrate, calcium pyruvate), Bulking Agent (microcrystalline cellulose, maltodextrin), Stabiliser (cross carmellose sodium), Binding Agent (acacia gum), Anti-caking Agent (veg. stearic acid), Acidity Regulator (citric acid). Our UK Health Shop sells real Health Aid and other Minerals A - Z from top-quality brands safely online to customers throughout the United Kingdom in England, Wales, Scotland and Northern-Ireland. View more products on the Online Health Food Store from Health Aid. Where to buy Health Aid Calcium Complete 800mg safely online? Shop at the Online Health Food Store if you are wondering where you can buy Health Aid Calcium Complete 800mg - 120 tablets safely online in the United Kingdom. Our Health Shop is located in the UK and our award-winning independent has been serving customers in England, Wales, Scotland and Northern-Ireland since 1976. You can buy our Minerals A - Z online and we post out orders to any UK address. Calcium Complete 800mg - Health Aid Calcium Complete 800mg - 120 tablets in Minerals A - Z and Vitamins and Minerals.